Commack, NY - June 16th, 2015 - Suffolk County Crime Stoppers and Suffolk County Police Fourth Precinct Crime Section officers are seeking the public’s help to identify and locate the woman who stole merchandise from a Commack store. 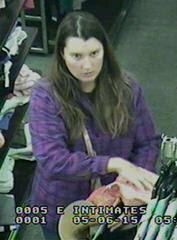 On May 6, 2015, at approximately 6 p.m., a woman entered the Kohl’s department store, located at 45 Crooked Hill Road, and removed several pieces of jewelry from the display. The suspect eventually left the store without paying for the jewelry. Subject: LongIsland.com - Your Name sent you Article details of "Woman Wanted for Stealing Jewelry from Commack Kohl's Store"